The 5th and latest album from Daddy-O! Double-Album on One Disc! 25 tracks of Rockabilly, Rock & Roll, Doo Wop, Swing, Country & more. New songs by RC & Brenna. Listen to samples and download singles or purchase CDs here. 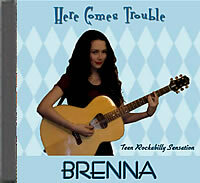 The debut CD from14 year old rockabilly singing sensation, BRENNA. 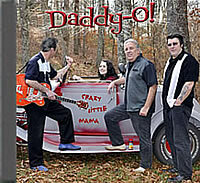 12 songs of Rockabilly, Rock & Roll, Doo Wop and Country. Recorded live in the studio with Daddy-O!. Listen to samples and download singles here. The third album from Daddy-O! 19 tracks of Rockabilly, Rock & Roll, Doo Wop, Country & many new original songs by R.C. With JB on drums & Special K on bass includes "Love Is Strange" a duet introducing 14 year old rockabilly singing sensation, BRENNA and "Big Legged Woman" with Wildman Wil on tenor sax! The second album from Daddy-O! 20 great songs from the Fifties, including their airplay songs "C'mon Everybody" and "Diner". 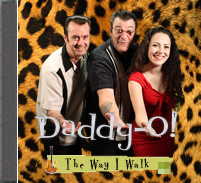 Rock&Roll, Rockabilly, Doo Wop, R&B and pop recorded live in the studio, just like they used to! Relive the Fifties, have some Fun! The first CD from Daddy-O! Filled with 16 great songs from the fifties that make ya wanna dance! Remember when Rock & Roll was fun? Then, check this out! RC and Daddy-O! (with some special guests) perform this music the way it should be: raw, exuberant and inspired. "Rather Be Alone" is BLUES ALLEY's latest release. Available on CD & cassette, the 15 original songs are complemented by a 3-piece horn section, harmonica, percussion, keyboards, and backup singers. Many styles here: Latin, Soul, Funk, and Swing; all firmly rooted in the Blues! BLUES ALLEY's first full-length CD. Performed in a live take in 2 nights, the band rips through 12 original tunes by RC. This is raw Blues with influences from Soul, Funk, Gospel and Swing. DJ's have praised the CD as "Great stuff...lots of fun", "Eclectic", "Stories are funny, deep & off-beat". LEE FORTIER "Turn It Up"
Lee Fortier has the most original harmonica style you'll ever hear. His sound is clean, impeccable and direct; and his choice of material shows off his command of the instrument as well as the genres. R.C. produced and performed along with BLUES ALLEY, supporting Lee with tasteful backups in Blues, Jazz, Swing, Western and Folk. Famed Blues Harpist Charlie Musslewhite loved this album; you will, too! Jan Stanley, who was a backup vocalist on BLUES ALLEY's latest release, "Rather Be Alone", has her own CD, "THREADS". This beautiful recording of all Jan's original material is soothing and evocative. The music has many influences: folk, classical, jazz and New Age. Great at the end of a stress-filled day!